Editors Susanna Price and Kathryn Robinson explore the social aspects of Chinese economic growth in their soon-to-be-published book, Making a Difference? 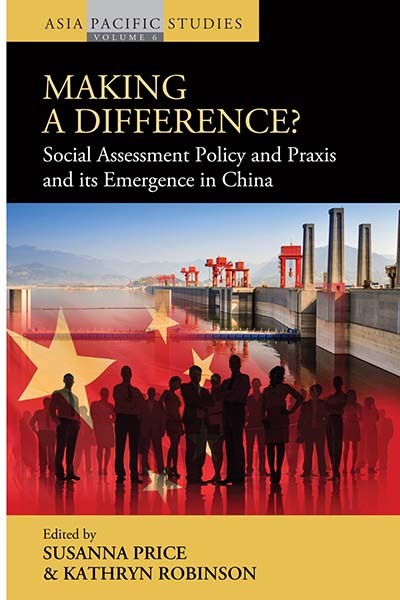 Social Assessment Policy and Praxis and its Emergence in China. Following, Susanna Price offers further insight into the book’s origins and the impact the book may have on the field of Asian development studies. We are all familiar with the striking, sometimes wildly exaggerated, news headlines on China’s rapid economic growth, its geo-political consequences and – perhaps less frequently − the possible flow-on implications for liberal democratic governance. We felt that such headlines, focusing on growth, overshadowed an alternative narrative, on the social dimensions of that growth and transformation. It came down to a simple wish: we wanted to tell a different China story that reflected our own experience and practice. Some of us had worked together for a decade or more in and out of Asia, including China, on applied social research and practice. Some of us came from longstanding, formative academic social science research backgrounds. Others amongst us were relative new comers – to China or to social research. We gathered in Kunming in 2009 when the idea for this book was first mooted. But we didn’t want to exclude non-China material. We wanted to set the book in a broader Asia regional context of the practice of social assessment and social impact assessment both amongst governments and amongst corporations. We felt this would give both a historical dimension and some comparative insights to the use of sociological knowledge in the development domain in this rapidly growing region. Why is the timing significant? Since it was originally conceived, some of the broader issues raised in this book have catapulted to global attention. Firstly, the widespread pre-occupation with predicting China’s future economic growth rate only escalates. “Can China keep up its spectacular economic growth?” shout the headlines. “Will growing inequality undermine economic growth?” Beyond that first moment of apprehension, such headlines create the opportunity for a more reflective look at the underlying patterns and impacts of the social transformation, of uneven growth, of escalating inequality – and raise the possibility for alternative forms, conceived in whatever terms, of socially responsible investing. Second, top global bodies, such as the G20, call for more infrastructure, especially in Asia. That raises the question of impacts on people, on communities. How will those impacts be managed? How will the inevitable fall-out for some people be addressed? Increasingly, the question of “quality” and “social safeguard standards” emerges into sharper relief, as explained below. Third, the future of the “social safeguards,” as conceived and pioneered by the World Bank and re-packaged by other influential international financial institutions over recent decades, is the subject, currently, of heated debate. Civil society groups charge that, whilst the most recent draft policy safeguard revision enhances the policy rhetoric, simultaneously it creates procedural loopholes and introduces discretionary elements that will undermine systematic application. As we describe in this book, those social safeguard standards played a significant role in the story of social assessment in Asia, and elsewhere – whether critiqued, rejected, or selectively emulated. And this question takes on added significance in light of the final point below. Finally, as China and other emerging economies begin to form their own international financial institutions – China’s Asian Infrastructure Investment Bank (AIIB), for example, was established just a few months ago – their establishment throws into even sharper relief the question of the social safeguard standards that may apply to infrastructure loans they finance. And this question attracts attention beyond civil society advocates, it has taken the form of a debate at the top. At the G20 meeting in Brisbane in November 2014, for example, the leading multilateral development banks issued a warning on diluting “quality of spending” in the developing world. China’s Finance Minister announced recently that China will set high standards in AIIB’s safeguards. China would learn from the experience of other international financial institutions − but it would learn lessons and avoid “bureaucratic, unrealistic and irrelevant policies,” he said. What will this mean for Asia? Amongst the measures for governance, environment, and social issues promoted over the years by the international financial institutions, what will be deemed to be workable, relevant, and realistic for this new Asia infrastructure bank – and what will not? The safeguard experience, in essence, has played out in internationally financed projects in China’s own vast and differentiated spaces over several decades. This book explores some of this terrain that may be drawn upon in making such judgements. It foreshadows some of the key questions. Would China adopt western-style social impact assessment (SIA) with local participation and transparent public disclosure? Would a China-specific “project investment social assessment” prevail, which aimed to match projects with their social context, encompassing a broad analysis of both social risks and opportunities, as some had earlier anticipated? Or would China’s newly conceptualized “social stability risk assessment” (社会稳定风险评估) be considered sufficient to deal with project-related social risks and social costs? How would such decisions play out through numerous local offices and sites throughout China? And, more broadly, would this experience resonate throughout Asia region through the new, China-led international financing organizations? The reflections presented in this book provide a background perspective on such forthcoming decisions that will have potentially momentous consequences in Asia as a whole. Susanna Price is a Research Associate in the College of Asia and the Pacific at the Australian National University. She has pioneered strategies for social assessment, starting with AusAid, and was then recruited as a social development specialist, with a lead role in resettlement, by the Asian Development Bank. She is recognized internationally as an expert on social assessment in resettlement associated with major infrastructure projects. Publications include a special edited volume on resettlement in Asia Pacific Journal of Anthropology (2009). Kathryn Robinson is Professor in Anthropology at the Australian National University, in the School of Culture, History & Language, College of Asia and the Pacific; and is a Fellow of the Academy of Social Sciences in Australia. She specialises in Anthropology, Economic Geography, International Relations, and Gender Specific Studies. Publications include Gender Islam and Democracy in Indonesia (2009) and Asian and Pacific Cosmopolitans: Self and Subject in Motion (2007). She also works as a development consultant in Southeast Asia and the Pacific.